Let me tell you something about my history with pies: I don’t have much of one. Up until about a year ago, I had never attempted a from-scratch, all-butter, roll-out-and-pray kind of pie on my own. I think I made one or two with my grandma a long time ago, and I’ve made lemon meringue pie with my mom plenty of times. But otherwise, if it didn’t have a press-in graham cracker crust and an easy filling, and it was called “pie”, I wasn’t baking it. To be honest, from-scratch pies have always made me uneasy. Which is weird, really, because I have no hesitation when it comes to fairly intimidating things like cinnamon rolls or scones. I normally take on nearly any baking challenge with relish. And yet. Pie crust. It scares me. I think it has a lot to do with the fact that nearly any recipe you read will tell you the world will end if your dough gets warm. That’s a lot of pressure to put on someone who is trying to roll out and shape an unwilling dough into a pie-able shape in an extremely short amount of time. This is, of course, after you’ve already had to cut a LOT of butter into flour, which is actually my least favorite baking-related task in all the world. It’s even worse than dishes, if that’s possible. 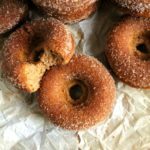 So the fact that you can ruin all that work just by allowing the dough to come to room temperature or by working it a little too much, well, that was more than my impatient self could handle. Then, if you’ve survived the gauntlet of making and shaping the dough without incident, there’s still pie weights, pie birds, pie guards, egg vs. cream wash debates…it’s really enough to make one reject the whole project. And so I did, for a long time, until one day last fall when I had a rather large pile of applies staring me in the face from an over-stuffed crisper drawer. I don’t know what came over me, but all of a sudden I was perusing 10 different recipes for apple pie like a madwoman. I decided that this thing that had eluded me for so long was no longer going to do so. And guess what. Not to brag, but I made the best dang apple pie I’d ever had. 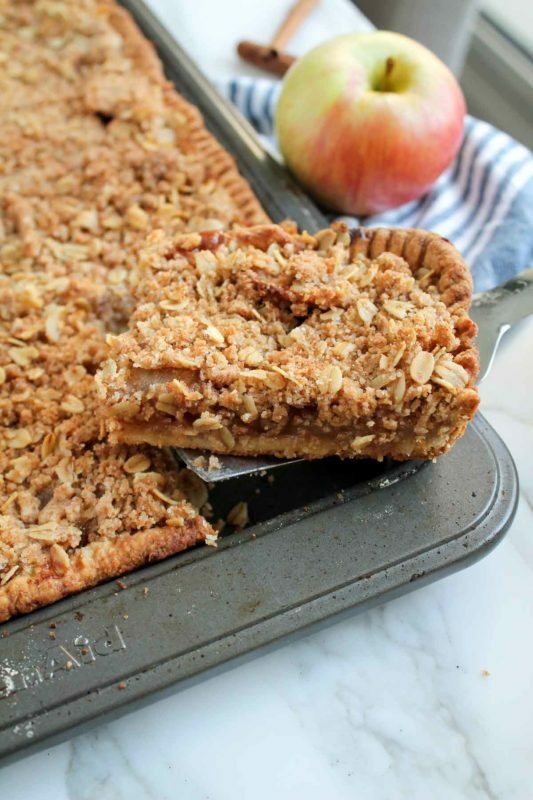 Turns out, you can make the pie crust in the food processor in about 2 seconds (hooray! 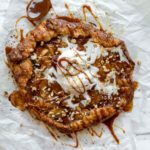 ), it doesn’t actually take all that long to roll out and shape pie dough, and if it does get warm, well, just put it in the freezer for a while and everything will be ok.
Well, there’s a little more to it than that, but that’s the gist of it. Today, however, we’re doing something way easier than a lattice pie. 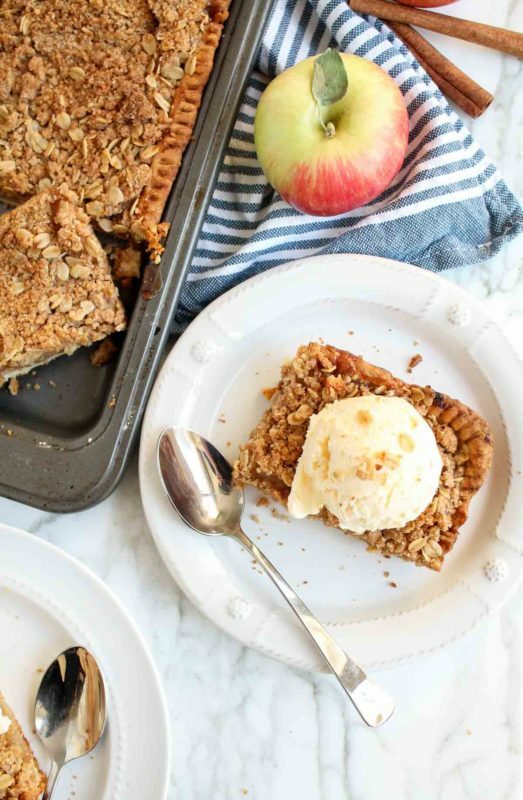 I decided to do an apple crumble slab pie for two reasons: 1. I had two different parties to go to one weekend and only wanted to make one dessert; 2. 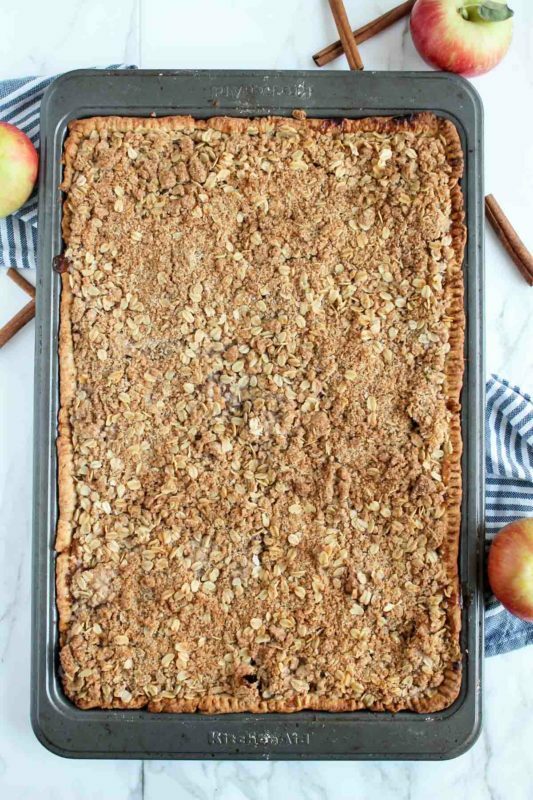 I love apple crisp and needed to make a portable version of it. This fits both of those requirements! 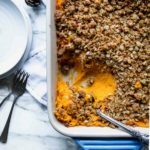 Slab pie is perfect for when you need to feed a lot of people, but you want something that also doubles as finger food at a party. The last thing people want to do at a BBQ is try to fork and knife a sloppy piece of pie. So, this is that! 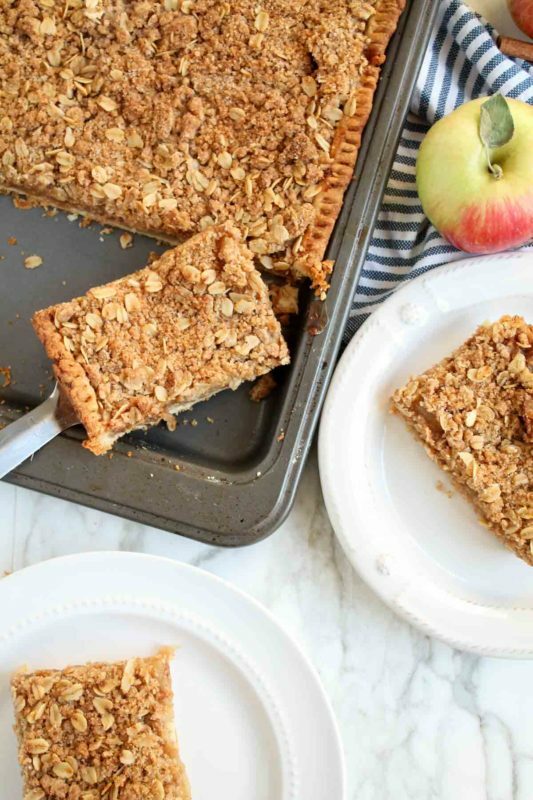 You make the pie dough in the food processor, roll it out and press into a jelly roll pan, dump your spiced apple filling in (I prefer to cook my filling first to release the juices of the apples and concentrate the flavor), then sprinkle your oat crumble topping on top. 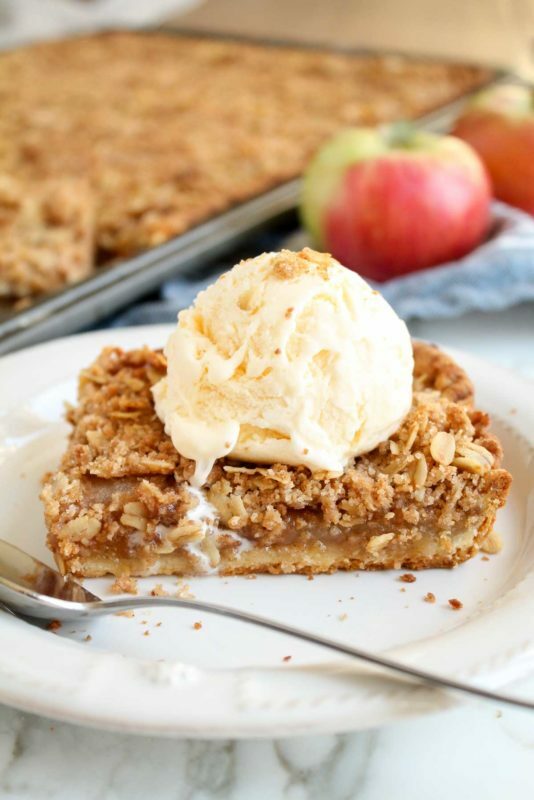 No crimping, no weaving, none of that – just a few steps to apple crumble slab pie heaven. And it most certainly is heavenly. 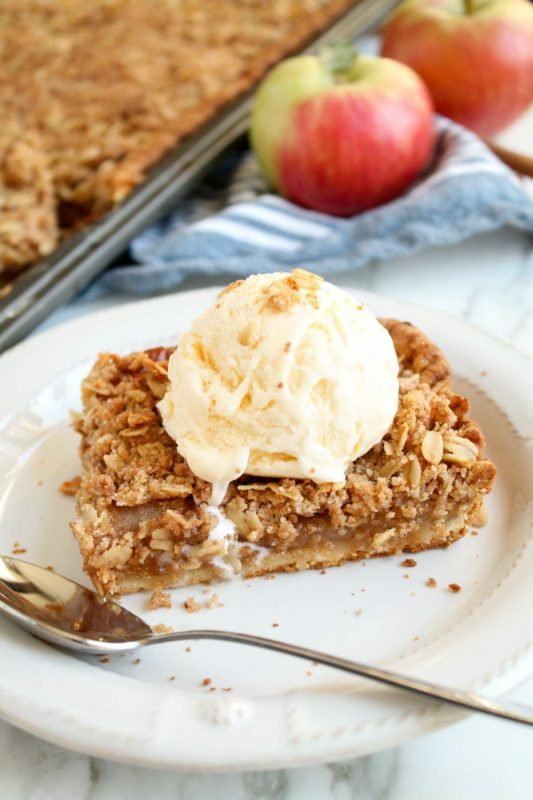 If you are in a situation where you have the time and wherewithal to put vanilla ice cream on a warm piece of this apple crumble slab pie, please, please do so. I promise you will not regret it. 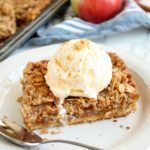 Apple crumble slab pie combines the buttery, flaky crust of an apple pie with an oat crumble topping and peak fall apples. 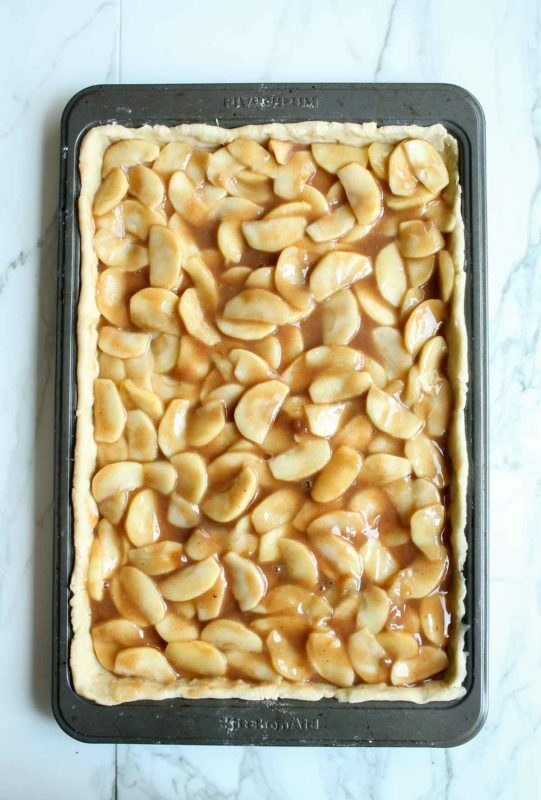 Best of all, baking in a sheet pan means no lattice or crimping required. Combine all ingredients except buttermilk in the bowl of a food processor. Pulse until butter is well combined with the flour and the mixture looks sandy. Add buttermilk and pulse a few times until a dough forms and starts to ball up in the bowl. 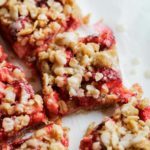 Turn the dough out onto a clean surface, shape into a flat square, then wrap in plastic and refrigerate for 30 minutes while you prepare the filling and crumble topping. In a large saucepan or pot, bring the apple cider to a boil over medium heat, and boil until reduced by half and mixture becomes syrupy, about 3-5 minutes. Add the apples and all other filling ingredients to the pot, and cook over medium heat until the apples release their liquid and the filling thickens, about 5-7 minutes. 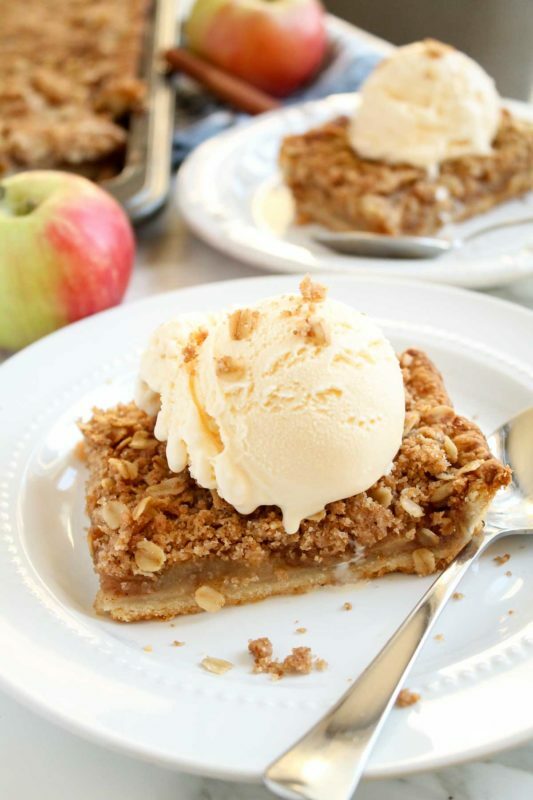 Remove from heat and let cool while you prepare the crumble topping. In the bowl of a food processor (I use the same one as I used for the pie dough above and don't bother rinsing), pulse flour, sugars, and butter together until butter is well-combined with the flour and the mixture resembles coarse crumbs. It's ok if you combine this less fully than you did the pie dough. Transfer butter/flour/sugar mixture to a large bowl. Stir in oats and spices until fully combined, and set aside. 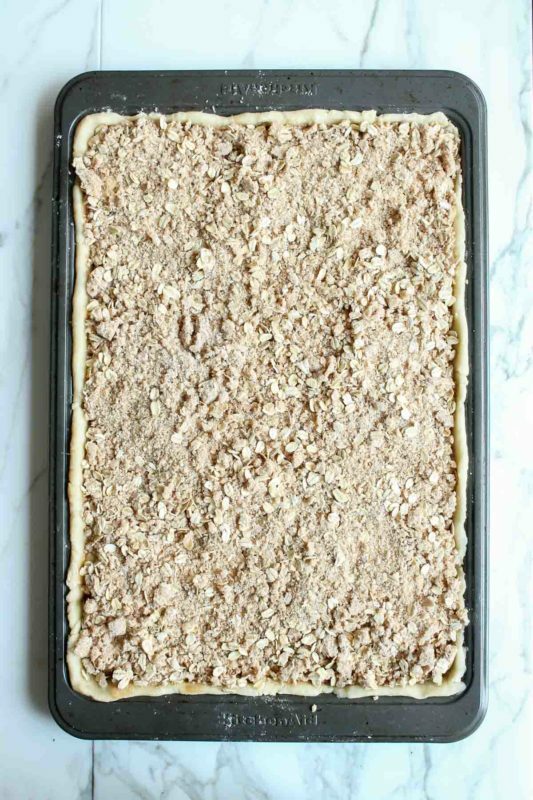 Remove the pie dough from the fridge, place on a clean and lightly floured surface (I used my countertop), and roll out dough to an 18-by-13-inch rectangle. Fold the dough in half, then in half again (so it's a quarter), and transfer it into a 15-by-10-inch rimmed jelly roll pan or baking sheet (this is the easiest way to transfer it without ripping). Unwrap the dough in the pan, pressing into the corners and up the sides. Pour the apple filling over top, making sure the apples are evenly distributed. Dump the crumble mixture over top of the apples, trying to cover them all completely and evenly. (Optional) Press the tines of a fork into the visible pie dough along the edges of the pan, creating a flute pattern. 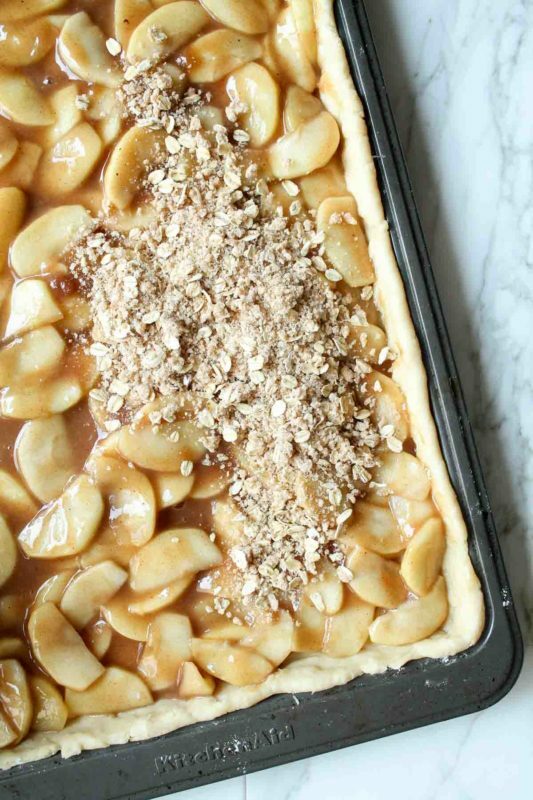 Bake pie for 45-50 minutes, until crust and topping is golden brown and filling is bubbling. Let cool to room temperature (I know, it's hard) before slicing into 16 (or more) pieces and serving with vanilla ice cream! Pie will keep, covered at room temperature, for up to 2 days. It will last up to 5 days in the fridge! Adapted from King Arthur Flour's Apple Pie recipe. Hi Megan – I used Honeycrisp. I’m sure Gala would work too – or a mix of different kinds!